New figures from Age UK reveal the vast numbers of older carers being left to fill the gap as our social care system crumbles. 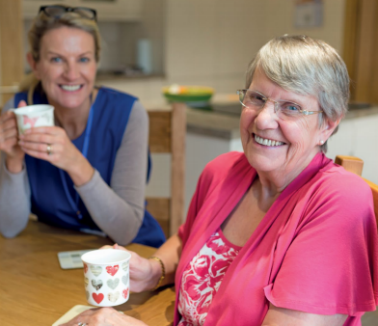 Older carers now providing nearly 54 million hours of care a week in England. In 2015/16, over two and a quarter million (2,299,200) people aged 65 and over provided care – a 16.6% increase on five years ago when 1,829,200 did. Over 400,000 (404,400) of these unpaid carers are from the oldest demographic in our society (aged 80 and over), and they provided 12.7 million hours of care in 2015/16 – a 12.7% increase from 2009/10. Over half (54.8%) of people aged 65 and over who provide at least one hour of care have a long-standing illness or disability – equating to well over a million people (1,262,500), or one in ten (10.7%) of all these family carers aged 65 and over. In addition, research by the Charity revealed that nearly a third (28.9%) of informal carers aged over 65 are experiencing feelings of loneliness. This can have a negative impact on an older person’s mental and physical health, compounding the serious challenges many older carers already face. Caroline Abrahams, Age UK’s Charity Director said: "I have heard that there’s a view in some parts of Whitehall that the State can go on underfunding social care because enough good-hearted family members will continue to step in, despite the personal cost, and take on the role for free. This is extremely complacent and, as these new figures show, it risks undermining the health and wellbeing of hundreds of thousands of older people who want to help a loved one, but who we can’t expect to do it all themselves. "How can we explain to older people the Government’s decision not even to mention social care in the Budget, let alone announce further investment, despite the overwhelming evidence that the system needs an urgent injection of extra funds? The most recent warning came from the Competition and Markets Authority, who concluded in an authoritative report just last week that the care home market is broken and financially unsustainable. "The Government has an early opportunity to make amends for its neglect of social care by putting significantly more money into it in the Local Government Settlement, due to be published soon. The care funding gap has been estimated by experts at £2.5bn so this is the kind of investment they should be making." Carers UK’s Chief Executive Heléna Herklots CBE said: "This research demonstrates that older carers are at breaking point, with many witnessing a fall in support as their hours of caring increase. As we approach the New Year, we know that many older carers will be looking into the future with a great deal of uncertainty. It is vital that the Government recognises the growing pressures on carers and commits to increased funding for social care as a matter of priority. "Additionally, given the clear correlation between longer caring hours and loneliness, revealed by Carers UK’s own research as well as Age UK’s, we cannot afford to continue ignoring the issue of isolation which carries such a heightened risk of mental and physical ill-health. We know that regular breaks from caring make a significant difference to combatting this loneliness, yet access across the UK remains inadequate and patchy. The Government must couple any measures to address shortcomings in our social care system with tangible improvements to respite access. Without a transparent and sustained system of funding for breaks, more carers will struggle to keep going in their roles. The government must act now in order to alleviate the growing strain on older carers which will only increase if left ignored until summer next year."